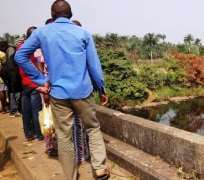 Seven people on Tuesday lost their lives as a truck in which they were travelling plunged into a river at Kotonkarfe Community on Lokoja-Abuja Highway. Sector Commander, Federal Road Safety Corps (FRSC) in Kogi, Emmanuel Abe, confirmed the incident in Lokoja. Abe, while confirming the report, said that the truck plunged into Enyogi River, a tribute of River Niger at about 5.00a.m. He said 37 people were involved in the accident, adding that many others sustained various degrees of injury. According to him, both the injured and dead were taken to the Federal Medical Centre and the Kogi State Specialist Hospital, both in Lokoja. Abe said that speeding was the immediate cause of the accident, appealing to motorists to abide by the speed limit rule.